Today, January 12th, we show you the Garden on January 10th. 1월12일 오늘은 1월10일의 원내모습을 소개드리겠습니다. 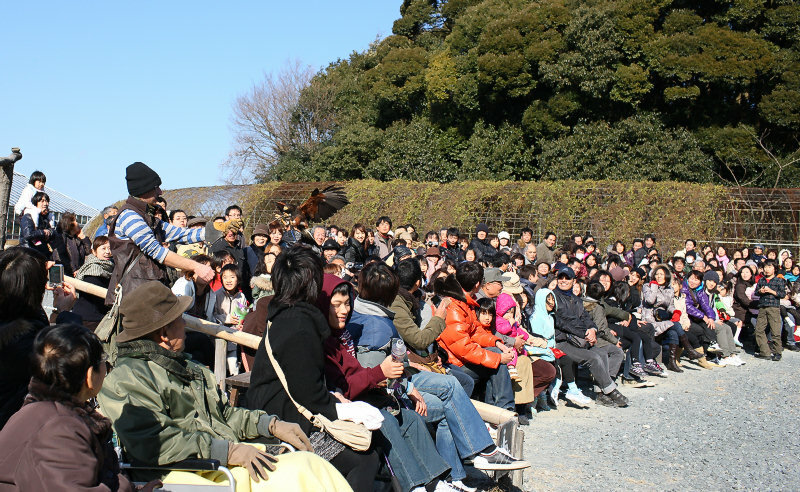 Second days of the three straight holidays in Japan and with sunny mild weather compared to New Year holidays, the Garden had many visitors in the daytime. This picture shows the Buffet Restaurant area in the Main Greenhouse;almost all the seats were occupied. 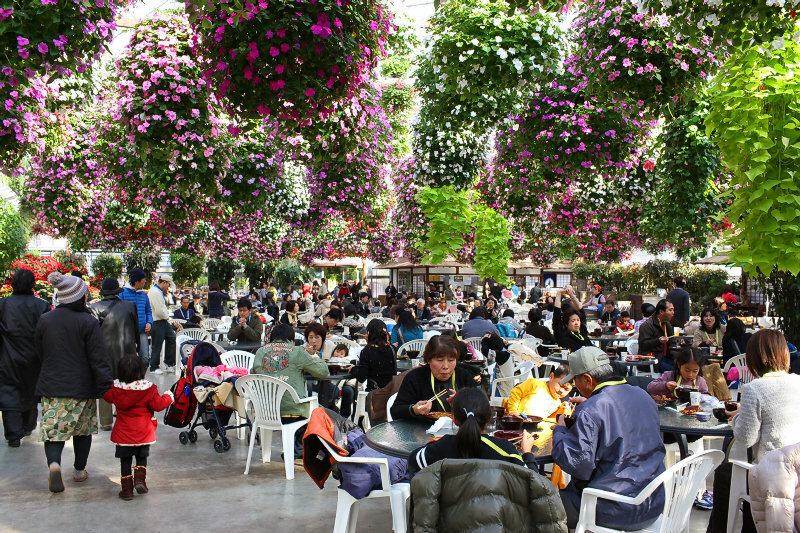 Hanging baskets of Impatiens above visitors were in good bloom, bringing into the Garden an atmosphere of spring. 이날은 일본에서 3일연휴중의 이튿날이였습니다.맑은 날씨에 기온도 원단보다 높아서 손님들이 많이 와주셨습니다.사진은 대온실의 플라워레스토랑코너인데 점심시간에는 자리가 거의 꽉 차있었습니다.머리위의 봉선화꽃이 원내에 봄냄새를 물씬 풍겨 주었습니다. 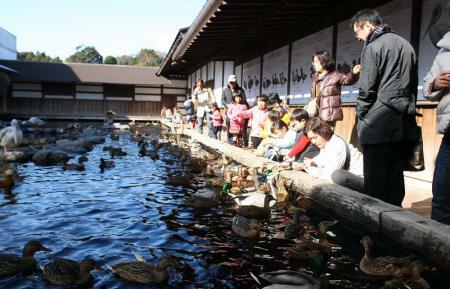 Many visitors were seen arond the Waterfowl Pool too. 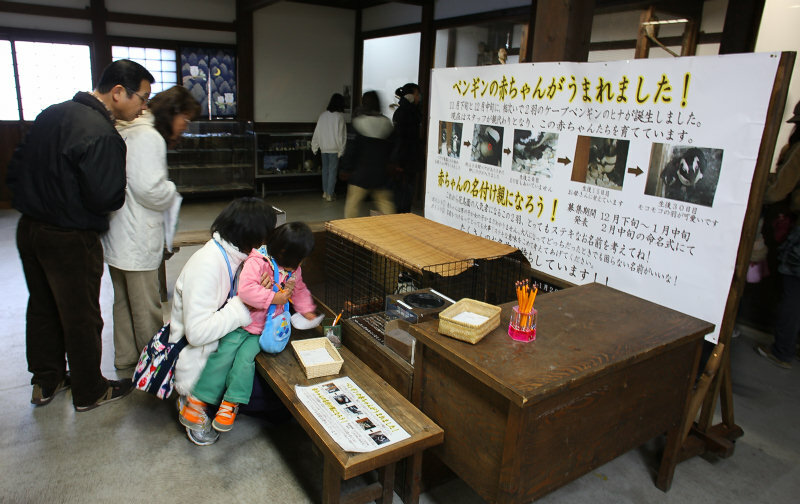 Owl Collection in the Nagayamon edifice. Rarely featured on this weblog, 27 species of owls are under permanent exhibition here, and souvenirs are sold in the earth floor. 여기는 나가야문내부의 부엉이전시시설입니다.이 블로그에서는 별로 소개한적이 없는데 이 전시시설에는 27종류의 부엉이가 전시되여 있습니다.전시시설 사이에는 토산품코너입니다. At a corner of the Owl Collection is a special corner for exhibition and name entry of the penguin's nestling that was featured here only the other day. THe name entry will be accepted here until the end of this month. 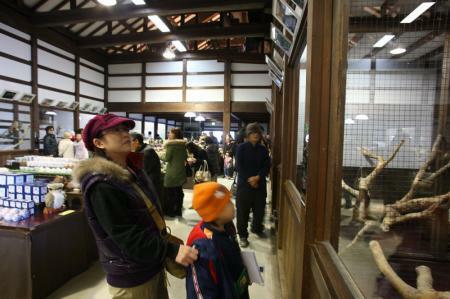 In thsi picture, a girl wrote down her name in a form for an entry. 부엉이전시시설의 한쪽 구석에는 지난번 소개드렸던 아기펭귄의 전시 및 이름모집코너가 있습니다.여기서는 이달말까지 아기펭귄의 이름을 모집합니다.마침 응모용지에 아기펭귄의 이름을 쓰고 있는 여자애가 있었습니다. A shot of Gary the trainer landed by a Harris Hawk in a flight show from 13:00. 오후 1시의 비행쇼에서 등장하는 하리스매와 갸리씨입니다. 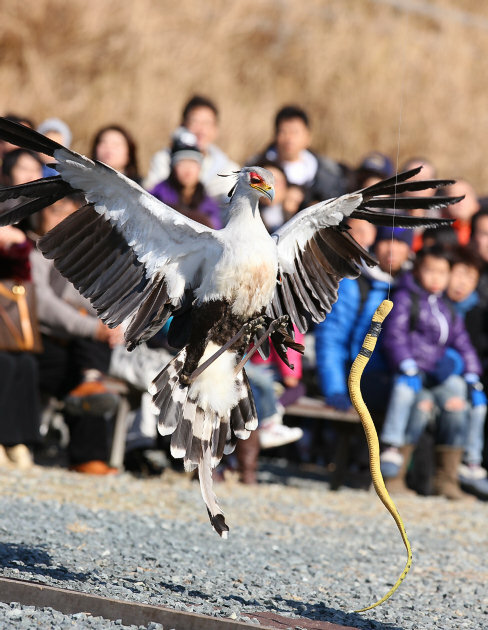 Shows of Harris Hawk, Saker Falcon, Rock Eagle Owl and Secretary bird are held, and a short attraction of three Decoy duck is also seen. 하리스매,새홀리기,벵갈수리부엉이,그리고 뱀잡이수리를 볼수 있을뿐만 아니라 귀여운 3마리의 오리도 등장합니다. The wind was mild on 10:00 that day, but it got stronger in the afternoon. However, with an absence of cloud that blocks the sunshine, it was rather good climate for a winter day, and the show site was crowded with many visitors. 이날은 오전 10시에는 바람이 별로 크게 불지 않았는데 오후부터는 바람이 세게 불리 시작했습니다.하지만 햇님이 구름뒤로 숨지 않아 따스한 해빛이 비춰 손님들이 쇼장에 가득 찼습니다. Kick the Secretary Bird also showed us good jumping kicks. A year after arrival to the Garden, its damaged tail feathers regenerated well. Some gaps are seen on feathers on the wings;some feathers are cut to disable long-distant flight. 뱀잡이수리 킷쿠쨩의 한수입니다.킷쿠쨩은 당원에 온지 곧 1년이 다되가는에 당원에 방금 왔을때 상황이 별로 좋지 않던 꼬리도 이제는 완쾌하였습니다.날개사이에 깃털이 조금씩 빠져있는 것은 멀리 날아가지 못하게 꺾어 놓은것이라고 합니다.